Panasonic has announced that world-renowned illusionist Criss Angel has selected its professional visual solutions to help create his vision for an over-the-top theatrical spectacular: Criss Angel MINDFREAK® at Planet Hollywood Resort & Casino Las Vegas. The brand new production, in the newly-renamed Criss Angel Theater, will feature more than 75 of Angel’s iconic signature illusions – with 20 never-before-seen effects – and integrate some of the most innovative visual technology provided by Panasonic. Through the partnership, the show will utilize 10 PT-RQ32KU 3-Chip DLP™ SOLID SHINE 4K+ Laser Projectors, 16 EF1 Series 84″ Professional Displays and three AW-HE40 integrated HD PTZ Cameras to support the production. Angel’s previous production at Luxor Hotel & Casino used lamp-based projectors that were bulky, threw off heat and required continual maintenance and output power loss. By switching to Panasonic’s PT-RQ32KU 3-Chip DLP™ SOLID SHINE 4K+ Laser Projectors, the team will no longer have to purchase and change lamps regularly. These 4K+ laser projectors are capable of virtually maintenance-free operation for up to 20,000 hours thanks to air-tight and dust-resistant optical units and cooling systems negating the need for air filters, saving the production time and money. Offering an impressive 27,000 lumen maximum brightness (center-screen, high mode operation) at 5120 x 3200-pixel for 4K+ resolution, this all-in-one projector incorporates Quad Pixel Drive technology, which quadruples pixel density and renders the finest details in exquisite 4K+ resolution. With the PT-RQ32KU’s 4K+ capabilities, 20,000:1 dynamic contrast ratio and 240Hz high frame rate, images will be sharp and realistic to fully engage the audience with the projected images and virtual world created in Angel’s performance. The need for custom mounting-frames has also been eliminated with new frame-free stacking or i-bolt rigging capability, significantly reducing overall weight and space requirements, making it easier to support multi-projection 360° mapping applications. 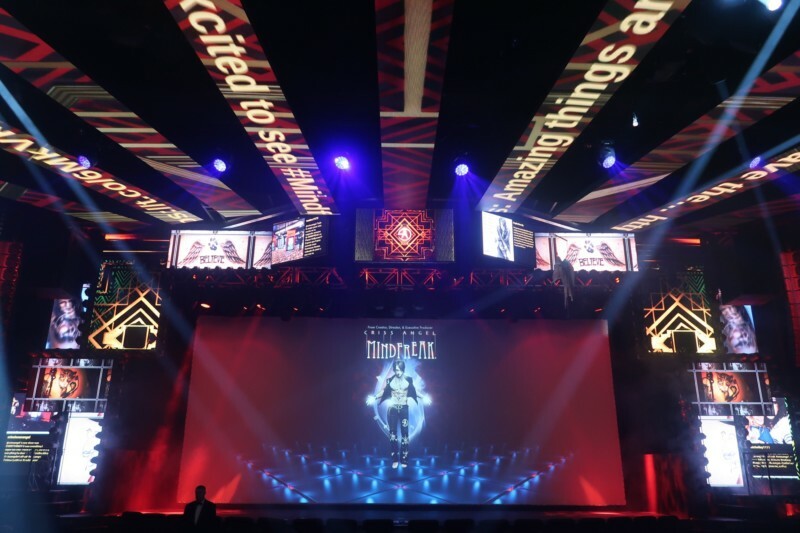 Because the PT-RQ32KU laser projectors have a smaller footprint than Angel’s previous technology, the Criss Angel Theater is able to include more projectors in the space, therefore enabling projection edge-blending to fully immerse the audience. The projectors will also be projecting images on a smokescreen as the audience enters the theater, where they will begin to be introduced to Criss’ virtual world even before the show begins.